Our Flavor Fanatics® love our dough made fresh daily, 100% real mozzarella cheese, premium toppings & 8 Flavored Crusts®. Try a perfectly baked Original Round, Deep Dish or Thin Crust pizza. Our calzone-style oven-baked subs are made with fresh pizza dough, stuffed with mouthwatering ingredients, then folded & baked to perfection. Everyone loves fresh, warm bread sticks, especially when they’re loaded with flavor. Try our hot, buttery, garlic bread sticks with zesty pizza sauce for dipping. Take it up a notch with our 3 Cheeser, Asiago, Cajun or Cinnamon Howie Bread®. A romaine lettuce mix is piled high with toppings and your choice of dressing. Pick one of our fresh salads as an entrée or side. Nothing goes better with our pizza. 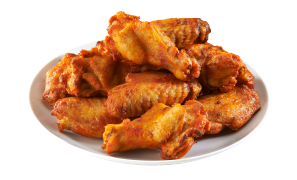 Juicy, crispy, and irresistibly flavorful that’s how we describe our Howie Wings®. From original to Sriracha and BBQ, our signature chicken wings can’t be topped. 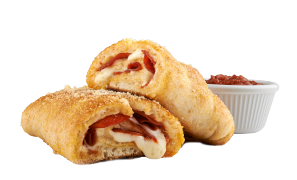 The ultimate handheld creations, our one-of-a-kind Howie Rolls® are stuffed with pepperoni, chicken or steak and melted cheese and expertly rolled in our freshly made pizza dough, then baked to perfection. 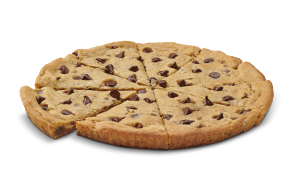 Top with your favorite Flavored Crust®. Don’t forget to satisfy your sweet tooth with one of our delicious desserts. Choose from our variety of Pepsi® products to compliment your meal. 2 liters and 20 oz. available. Enjoy!